I love baking with buttermilk, as most of you know. I recently made lemon buttermilk cookies and they were fantastic. I decided to try them again, but with a twist. This time I made cranberry orange cookies. The base is the same, but I added in orange zest and dried cranberries. I finished the cookies off with a orange glaze. So how do they compare to the lemon? It is a toss up, I love them both. I really enjoyed the dried cranberries. They gave the cookies a little something extra. The orange glaze was nice too. I think I will add these to my fall/holiday baking list. They really are wonderful and cranberry/orange is such a great combination. In the bowl of a stand mixer, beat the butter briefly, until creamy. Add the sugar, and beat until pale and fluffy. Add the egg, and beat well to mix. Add the vanilla, and beat briefly again. Mix in the flour mixture and the buttermilk in batches at low speed, beginning and ending with the flour. Scrape down the sides of the bowl with a rubber spatula as needed. Add in the dried cranberries. Drop the dough by level tablespoons onto the prepared baking sheets, leaving about 1 ½ inches between each cookie. Bake, 1 sheet at a time, for about 11 minutes per batch. Cool the cookies on the baking sheet for 1 minute; then transfer them to a wire rack. For the glaze, whisk together the sifted confectioners sugar, orange juice, and zest. I just guess on the amount. Brush or spoon the glaze onto the warm cookies. Allow cookies to sit on the rack until the glaze is set. I think your twist on these is fabulous.They look so delicious, good enough for breakfast. 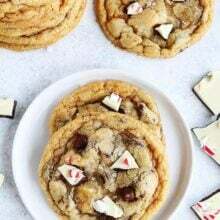 You always make the most delicious looking and sounding cookies! Yum! Maria, I think I love these LOADS! Anything with dried cranberries & dried cherries are winners for me. 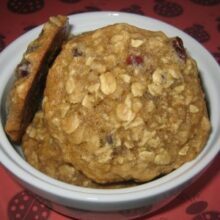 Just made oatmeal cookies with dried cherries today…couldn't stop eating them! Love these ones.mmm!! I’ve never baked with real buttermilk, just the make your own kind. You make it sound so good, I want to buy a carton! I love cranberry and orange together, they make wonderful combination. What a great recipe. Love the cranberry and orange together. Those look so delicious! I love Craisins and orange together, so I need to make these. Thanks for posting! I love how you can modify ingredients just a bit and get a whole new/different creative. These look just as good as the original! don’t you just love buttermilk in cookies and pancakes? I bet this is a wonderful taste. Reminds me of these organe/cranberry scones at whole foods, whenever I buy those I eat the whole thing. Cranberry and orange is one of my favorite combinations! I used to work in a breadstore and we made the best cranberry orange bread. I have no doubts I would love this cookie. I’m trying them for sure! Yum! Cranberry and orange are a delicious combo. Can’t wait to try these, they look great. These are fabulous cookies, Maria. I’m sure they will taste great dunked in some hot chocolate! Your cookies look fantastic! 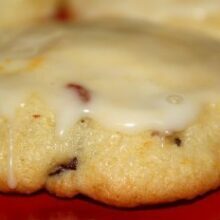 I made a cranberry orange cookie for Christmas last year and discovered the goodness that is cranberry and orange together! You make such yummy cookies! I can’t wait to try these! What pretty cookies! They look delicious! They look fabulous, my dear! Love the icing drizzled on top. My mouth was watering just reading the title. Cranberry-orange anything is good. They look fantastic! 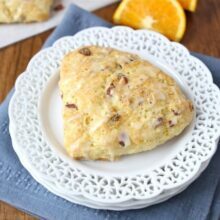 I love buttermilk in baked goods too and cranberries and orange go so well together! I especially love that orange glaze on top – yum! I love the zesty showing through and icing dripping. Lovely cookie. I stumbled it! you always have the most creative combination of flavors! These look wonderful! I love cranberry and orange together! Yum, those sound delicious. I have tried cranberry orange combo in cranberry sauces but never cookies. I love baking with buttermilk also. They look good with the mix of cranberries and orange. They baked up beautifully! You are very creative. I bet they’re BOTH delicious! Can’t wait to try these soon! Yum. Cranberry and orange is a delightful combination. I bet these were delish! Cranberry and Orange go so well together. Sounds good! Buttermilk is so magical to work with. The cookies look great! These are scrumptious! I love the glaze! YUM! Your cookies sound and look delicious. These are lovely and would make amazing Christmas cookies with their red and white faces. I love buttermilk cookies. Cranberry and orange are two of my favorite. I’m salivating here. I can just imagine how good these would be. What quantities do you use for the glaze? Yum, this looks really good!! I actually have some buttermilk leftover from the Tiramisu cake for TWD…. I guess I’m baking cookies tonight! I used to think that Cranberry was a winter based food but with orange, your surely brought it up to Spring… honestly I don’t believe in those rules anyway, I could have cranberry at any time. Oh Maria they look so soft and light, yummy! I make some similar to these with dried bananas and raisins. I’ll have to try them with cranberries next time I make them. 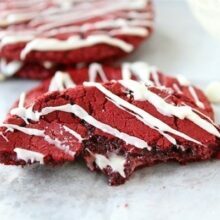 What a unique and delish looking cookie. They are so pretty, too! I adore orange and cranberry. I make orange cranberry muffins and these cookies seem like they would be their cookie cousin. Yum! You always think up the best combos! They look delicious. I love the glaze on them. It really adds something! ok seriously… can we please be neighbors… these look delicious!! Happy Monday – hope work is going well! I love that cranberry orange combo. AMAZING. I can’t wait to try these. Buttermilk is such an amazing ingredient. Man oh man, I can’t wait to try these…eek, I’m getting redundant, but you have me convinced that I need these cookies ASAP. I think it’s so cool how you can just create fabulous dishes! I love cooking with Butter milk as well. Love your cookies! yum!! those sound so light and delicious! Hey girl. Long time no see. Sorry I have been a stranger, just less time to blog now that I am back to work. BUT these cookies look amazing. Really amazing!!!!! Life or grapefruit would be delish too! They look so delicious. I love the glaze. Oh my goodness! This blog is amazing! I think I am going to start with the french toast with cinnamon syrup first. I also want to try the artisan bread dough pizza. Where do I find the recipe for dough part? Thank you for my new food blog to stalk! This puts mine to shame! Wow, I love the sound and look of these cookies! Great combo of flavours. Buttermilk seems to make everything better…as evidenced with your cookies. So lickable! These sing to me in every way. All my favorite flavors. I just made these today and they are, hands down, my new favorite recipe! I also tried your lemon cookies a few months ago and think these taste better! One thing that I did differently is I incorporated the orange zest to the granulated sugar…..then added it to the butter……(like how you did in your lemon cookies). The orange flavor is so well blended! Enjoying a nice cup of tea on a chilly December afternoon!